The content of this topic has been archived on 1 May 2018. There are no obvious gaps in this topic, but there may still be some posts missing at the end. Running DESIGNATED DRIVER (Bleeding Edge, r49377) on a Linksys EA3500. The working 5GHz radio1 has an almost identical config. Sat May 21 03:50:27 2016 daemon.notice netifd: radio0 (2030): wlan0: Unable to setup interface. Sat May 21 03:50:27 2016 daemon.notice netifd: radio1 (2031): Using interface wlan1 with hwaddr 20:aa:4b:89:b6:68 and ssid "MikeU"
I don't know what that first "command failed: Not supported (-95)" error is referring to but it appears for the working radio1 as well so I assume this is not the problem. The real issue seems to be "Hardware does not support configured mode ... wlan0: IEEE 802.11 Hardware does not support configured mode (2) (hw_mode in hostapd.conf)". This is incorrect. hw_mode=a sets the WiFi device's wireless protocol to 802.11a and has nothing to do with the WiFi interface's operation mode ("Access Point"). Still experiencing this issue. Anyone got any ideas? Any troubleshooting tips? can you post your wireless config? I posted the contents of /var/run/hostapd-phy0.conf in my original post. Is there another related config file? If so can you tell me where it is? I would be happy to post it. Posted below. That /etc/config directory is probably a good one to remember. "wlan0: IEEE 802.11 Hardware does not support configured mode (2) (hw_mode in hostapd.conf)"
How do these two configuration files relate as they both seem to specify the WiFi device's "mode" (hw_mode and hwmode)? Also, where should I make changes (note that I use the LuCI GUI)? Also, I don't know if this helps but here is what the edit page looks like for the 2.4ghz radio0. 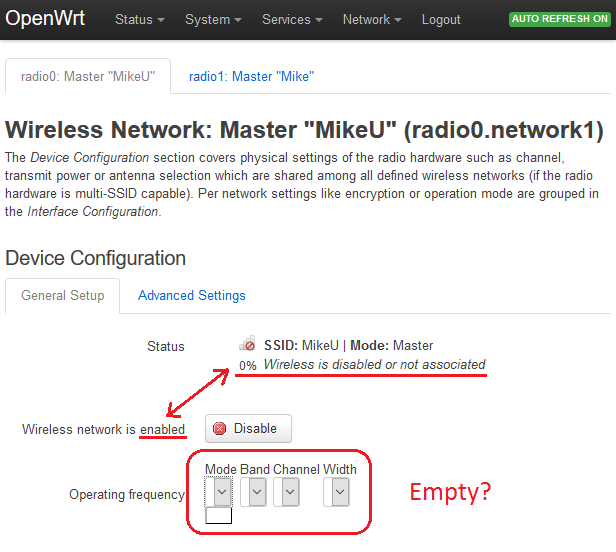 Notice that it says the radio is enabled but the status says it is "disabled or not associated". Also all the drop-downs for frequency are empty. edit config wifi-device 'radio0' and re-observe 2.4ghz radio. Would you mind explaining exactly what these changes mean? How did you know to make them? Could you also answer my questions in my previous post about how /var/run/hostapd-phy0.conf and /etc/config/wireless relate? Both these configuration files seem to specify the WiFi device's wireless protocol (hw_mode and hwmode) and other options. Further, I noticed that after making those changes to /etc/config/wireless and restarting, "hw_mode" in /var/run/hostapd-phy0.conf was updated automatically from"hw_mode=a" to "hw_mode=g". I assume this means that /etc/config/wireless is the authoritative configuration and I should make all changes there. The hostapd configuration files are created when the interface is brought up. They are generated from the values in /etc/config/wireless, which can be edited directly, modified through the uci tool or through the LuCI GUI. It's worth noting that /var on OpenWrt is a symlink to /tmp, so nothing there will be saved to flash. The issue wrtboy spotted was that the 2.4 radio (802.11b/g/n, hence "11g") was configured as a 5ghz radio (802.11a/n, hence "11a"). That makes sense. Thanks for the tip about /var. Actually, I have another quick question. What are these lines for? It seems to work fine without them. Is there a reason why it is necessary to set the channel width and transmitter power rather than leave them at the default? Operating frequency Width: "40 MHz"
Should I make these changes to my 5GHz radio as well? Edit: I guess my real question is: What does changing the frequency mode/width do? Just a quick post to say the problem is also showing up for EA4500, and that the solution in #8 (https://forum.openwrt.org/viewtopic.php … 89#p327489) does indeed work for that router as well. On a related note, the problem is repeatable. It seems to disable your existing radio when you ADD an interface to an existing radio, like if you want to add a guest network to an existing 2.4 GHz radio. Oh, and to answer your question about frequency Width, it depends on your radio environment. Increasing your width may give you better reception, at the risk of increased collisions with other routers on neighbouring channels. So if you are in a WiFi congested area (apartment, etc.) it is suggested to stay on the narrow bandwidth (20 MHz). If you have a single home where you can set your router to an un-shared channel, you might get better signal strength from your devices with a wider bandwidth (40 MHz). When evaluating whether to use 20 or 40, use a WiFi scanner. Don't just test where your router is placed, but also test where your client devices will be located. If other routers are detected using the channel above/below your selected channel, you might encounter collisions with a 40 MHz width. I just wanted to second what Dekker said, i had this same problem on my EA3500 a few weeks ago after i made a guest network and fixed it in the same way wrtboy did, i didn't think to post about it because i thought i had messed up the config myself somewhere along the way and just not realized it.